Hospitality, the ultimate customer experience, often seems to backfire in the buzzy, atmosphere of a trendy restaurant. It’s all go as the hardwood, stone or concrete flooring, bare walls, polished wood tables and chairs, metal lighting, picture windows and open sitting and coffee-grinder kitchen areas vie with each other. While minimalism and easily wiped-down surfaces may make commercial sense, complaints about the resulting decibel ratings are not idle, here or overseas. Noise as an irritant ranked only behind service in a 2015 US survey of dining trends, 26 and 24 per cent respectively. In Victoria and NSW, 85dBs is the end of the Work Cover safe limit at which workers can complete an eight-hour day without wearing ear protection. Yet Melbourne restaurateur Chris Lucas regards noise as just another tool for successful restaurants. “When we set out to replicate the buzz of a Thai street market with Chin Chin, we did it carefully." Meanwhile, Good Food noted a peak sound there of “95dBs, which is about as loud as a jackhammer 20 metres away”. Creating a fine balance between the different influences and priorities is tricky, acoustic consultants say. Philippe Doneux, engineer at Acoustica, says he has fixed plenty of restaurants, bars, cafes and hospitality spaces where the acoustic environment does not work, where customers complain or do not come back. His colleague, lead consultant in acoustics, Keshav Dhayam, also warns about later acoustic alterations affecting the original design and even feel of the restaurant. Instead, upfront consider such things as seating areas where private conversion is possible; control of noise emissions from open kitchen area to seating area; and space planning and acoustic design of speaker systems or live music. Noise is accentuated, Dhayam says, when two parallel surfaces, such as parallel walls, and ceilings and floors, for instance, are made of hard materials and sound reflects and bounces off each surface, thus creating a reverberant space not suitable for a restaurant setup. Variations on how to control reverberation are central to many acoustic products and materials, and ideas. Knauf Plasterboard manufactures sound-absorbing plasterboard. Its 2013 Dine Hear campaign was won by Phoebe Baker-Gabb of Melbourne’s Foolscap Studio with a restaurant makeover concept to create what she called a “fractured” acoustic ceiling. Another entry, Mohr Fish, aimed to group crescent (“fish”)-shaped acoustic baffles in noise-penetrating areas. Suppliers and manufacturers are using advanced materials and technologies in their ranges of tiles, linings, baffles, panels and perforated plasterboards. Autex's Quietspace Panel, available in 25, 50, 75 or 100 mm, is lightweight, semi-rigid, impact resistant and durable, and is manufactured using a minimum of 45 per cent recycled polyester fibre. The Quietspace 3D Ceiling Tile is a durable, 3-dimensional ceiling tile in bright colours. Most noise attenuation is achieved with a combination of dense, soft fibre absorption and a 4kg or 6kg acoustic, often foil-faced, barrier, says supplier and installer of noise insulation systems, Peace & Quiet Insulation (P&Q). Reverberation absorption has become an important insulation treatment and can be effected by fixing foam tiles or acoustic absorption panels vertically to walls or horizontally to ceilings. P&Q has absorbent open cell sound absorption foam panels covered in a new wool fire-rated fabric. PQ reverb absorption panels if positioned well, can absorb most noise from reflective surfaces, and in busy hotel bars, for instance, can be suspended from ceilings so as not to interfere with wall decor or TV screens. They are 25mm thick and stand out 22mm out from a wall or below a ceiling. Acoustica’s Echosorb 25 & 50 are engineered to provide superior noise absorption for large areas, such as restaurants. Faced with high density polymer, they are ideal for wall and ceiling applications, surface finished with Vertiface fabric, or customised prints. When applied correctly, the products, says Acoustica, can reduce the overall noise by up to 10-12dB. They are either 25mm thick and lightweight (at 2.3kg/m²), or 50 mm (at 3.8kg/m²) with a surface skin to prevent the migration of fibres, even in high airflows. Pyrotek Noise Control (NC) product, Reapor, made primarily from recycled glass, was used as a ceiling liner and along one side wall alongside the staircase at Neapoli in Melbourne, a predominantly glass and concrete restaurant. Its estimated reverberation time of 2.9 seconds improved to 0.43 seconds after the installation of as little as 70m² of panels. Screenwood Acoustic Systems Ceiling and Wall Panels are made from solid timber slats in various profiles. They also incorporate an acoustic textile backing for better sound absorption, and are designed to be modular and pre-finished. The panels carry a Programme for the Endorsement of Forest Certification. All Screenwood Panels for internal applications are fitted with SC15 acoustic scrim fabric, which achieves an average sound absorption rating of up to 0.7* (sound absorption coefficient, NRC, ranges from 0 [total reflection] to 1.00 [total absorption]). Gyprock’s Perforated Ceiling Tiles (pictured right) are vinyl faced plasterboard tiles with sound absorption for acoustic control in commercial grid ceilings; the regular grid of 6mm has full depth holes to approximately 10 per cent of the panel area and combined with insulation provides a medium level of sound absorption to reduce echoes and reverberation. Armstrong Ceiling Solutions include Soundscapes Shapes, which can be hung individually or in configurations that help absorb sound, reduce reverberation time and silence in a space. Armstrong says they can reduce ambient noise levels by up 50 per cent, and are suitable for new-build and refurbishment applications, and are made of 80 per cent recycled material. 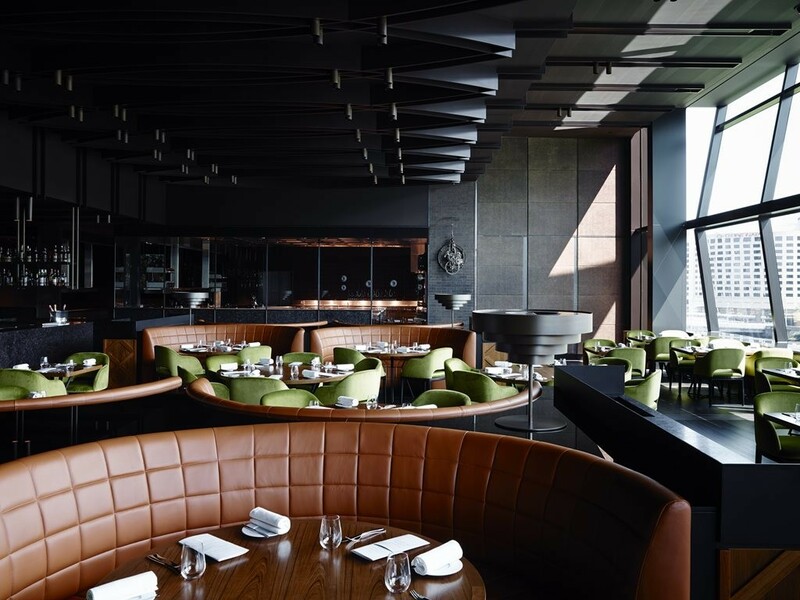 Winner at 2016 Eat Drink Design for best restaurant design, the Bates Smart Dinner by Heston Blumenthal (pictured right), was decorated in dark wood, brown leather, coloured velvets and burnished copper, a curated, comfortable experience, with what was called a "squishy” interior. Architectural Record (1 September 2016) talked about San Francisco Museum of Modern Art’s curated museum restaurant, praised by chef Corey Lee for being like an extension of the museum itself.